There was a race briefing 20 mins before the start. There were so many people around I couldn’t really hear what was being said. Next thing I knew I was saying my goodbye’s to my Support and making my way to the front of the startline. 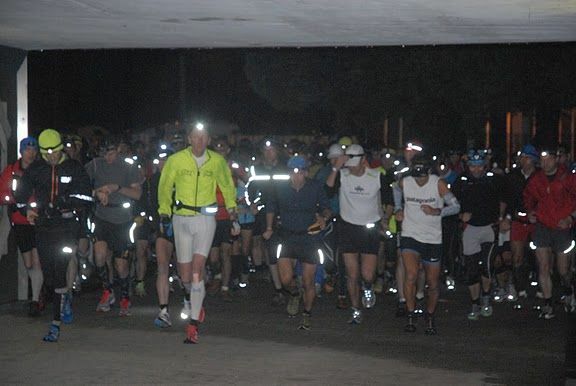 It was quite a sight – 150 or so runners all ready to do battle with whatever the WHW would throw at them over the next day. The start you can judge for yourself….it was amazing to be part of it. The first few hours felt pretty surreal. Running through the woods with just the light of a headtorch (and a few others) and the anticipation of what lay ahead was a strange feeling indeed. Heading towards the Beechtree Inn it was hard-going trying to avoid the huge puddles across the path. With 3-4 of us running together and your headtorch just lighting up the person in front there were some unwelcome last-minute changes of direction to avoid a feet soaking so early on. Going into Drymen I was with the american Mark Godale who seemed to be having issues with lighting. We trudged through the bog towards the gate and up to the throng of Support crews. This was the first time I’d seen my Support and I was desperate to remove some layers. A slightly haphazard waterproof removal and bottle-switch and we were away again up the road towards Conic Hill. It was still pretty dark but I could sense that it wouldn’t be too long before we’d see some light. Just before Conic Hill, Richie Cunningham came past – we chatted briefly and I was almost relieved that it meant I wasn’t going out way too fast. Heading down to the main climb (and due to the torrential rain we’d had) I was like ‘Bambi on Ice’ in my Inov-8 F-lite’s. No grip at all in the mud – the CH descent was going to be interesting! By the top of the hill it was light enough to see over the loch. In only a few minutes I’d be down in Balmaha (CP1) hopefully feeling good following the steep and slippy descent. I ran into the CP with one of the guy’s I caught on the climb, we chatted for a bit before I checked-in and straight out again to get stuck into the next section (one that I hate). First food stop was Rowardennan – 7 miles to go. I ran this next section entirely on my own (other than a toilet meet-up at Millarochy). My support team had some crazy flashing LED jackets on so that I could recognise them in the dark. As well as making me laugh they were really useful. I was grateful that Mr Ranger had kindly opened the toilets at 4am! At Rowardennan I was happy to have 27 miles under my belt. The crew had prepared some porridge which I stopped for a minute to try to eat. Wasn’t exactly sure of protocol on a long race like this….should I stop, should I walk and eat? I usually don’t stop at all. Marco Consani arrived soon after and I started to walk with my sister still trying to get some of the thick porridge down (with Marco 20 paces behind). Another couple of minutes and the food just wasn’t going down, I said goodbye to my sis and started running again. Marco soon caught me and we chatted again for a while before he pressed on, walking a fair bit of the steep climbs. His walking pace was pretty impressive and I kept plodding to try to keep him in sight. We traded places a couple of times before I needed another toilet stop. By the time I reached Inversnaid I’d been on my own for while. The Mountain Rescue people dug out my bag, I sank some electrolytes, chatted for a minute and forced down some more food. Mostly home-made raw energy bars and bites I’ve been experimenting with (tasted pretty good). Inversnaid to Beinglas takes you along the banks to the top of Loch Lomond. To look at it’s pretty impressive. It’s hard work to run. You just can’t get a decent rhythm going over the tree roots and large rocks and at times you feel like you’re getting nowhere. I just kept moving. Facing the final climb before Beinglas I spotted Marco in front which meant that the section hadn’t been as slow as I thought (going by the pace he normally runs). So at the top of the hill I sped up and by the time we arrived at the stile at the camp-site we were together again as we picked up our dropbags. Marco didn’t seem happy (and sadly later withdrew) – I grabbed my stuff, had some banter with the marshalls and took off towards Crianlarich. I decided not to walk this section and kept a steady pace up while forcing down some more food (this time some organic veg. baby food and more homemade energy bites). I was looking forward to getting to CP2 and seeing my support again – it had been a long time since I’d left them at the lochside. I just kept moving at a steady pace until the crossing under the road. Again I was on my own here. I walked the steep section up onto the track, picked it up again and within a short time faced the tricky hilly section at Crianlarich. My legs were feeling pretty good (better than they had for the first 30 miles) but the tops of my feet were starting to become an issue. I suffered some bruising on the top of my left foot after the Cateran Ultra a few weeks before and I’d hoped the lightweight shoes would help to keep it under wraps – no such luck. I decided just to ignore it and broke things up with the odd Jelly Baby and energy bite. I wasn’t being quite as structured with my drinks / nutrition as I normally am in the shorter races but I decided not to force things and hoped I wouldn’t pay the price later. About half a mile from Auchtertyre Farm (CP2) I spotted my support. I was pretty much on schedule (maybe only 15 mins down due to a slight distance miscalculation). I was weighed (had lost over a kilo) then stopped for a few minutes to eat. I was delighted to see my support although having spent the last few hours concentrating solely on moving, it was difficult to pick out sentences from the many questions / offers. I guess I probably came across as pretty dazed. I probably was. I forced down a few spoons of sweet-potato mash, drank some water, changed a top and was off again in just over 5 minutes. I missed one of the correct turns on route to Tyndrum but recognised it pretty quickly so didn’t lose too much time. As the miles passed and I reached the camp-site it was a strange feeling to run right through the Highland Fling finish line. Oh how tough that seemed at the time – I still had about 42miles to go. Onward – no point in thinking too far in front. I passed the Green Wellie stop and was told I was in 5th place. I wasn’t so bothered about my position I just wanted to get close to my target finish time. This was a long reasonably flat section once over the bridge at the top. The issue with the top of foot was starting to cut-through despite my distraction techniques. I dreaded the cobbled section across Rannoch Moor. By Bridge of Orchy the clouds were ominous. The food hadn’t been going down too well so the crew had prepared a complan shake which I drank with ease. It was starting to get cold – and my support team looked to be suffering it despite the many layers. They had been up for more than 24hrs so I guess that wasn’t helping much. Why was I doing this to them? My selfish running ambition was impacting their lives. I thought about this as I headed up the climb towards Inverornan with too much liquid slurping around my stomach. This was the first time I started to feel a little negative. I walked a fair part of the climb with my foot throbbing and I knew it would be worse on the descent towards Victoria Bridge. The saltire at the top and kind welcome lifted my spirits though. My Support were driving round to meet me at Victoria Bridge and that kept me going. I saw them before the gate and was offered a choice of snacks – none of which I felt any desire to eat. A pep-talk from my sister and some force-feeding I was on my way again looking forward to reaching the Glencoe checkpoint with views to inspire any tiring runner. The cobbles were gonna hurt. The rain started on Rannoch Moor, which pretty much matched my mood. It’s a long stretch which looks never-ending at times and you quickly understand the warnings about the exposure risk. By the ski-centre my foot was done, the right one started up in sympathy which if nothing else at least restored some balance to proceedings. I grabbed a waterproof jacket, ate some porridge and started walking towards the main road just as Thomas Loehndorf was approaching the CP. This was the point where I could accept that he would pass me or do something about it. I dumped the porridge and started running again towards the Kingshouse. Once off the road and back on the trail I stepped up the pace and kept it up to the foot of the Devil’s Staircase. I had re-established a gap and was feeling more positive again that I still had some reserves. Heading onto the climb I passed Craig Cunningham and into 4th. He had stopped to meet his support. This was an opportunity to put in a hard shift and maybe get a lead on both into Kinlochleven. I worked hard on the climb, running whenever I could up the zig-zagging path. Once at the top I moved as quickly as I could on the downhill doing my best to ignore the pain from every foot-strike. When I looked around I could see a decent gap and kept up the pace feeling pretty strong. As I got closer to finally getting off the hill something happened. Something that I’ve been struggling to think back on as it hurts so much. Near the big pipes there’s a fork in the road – I should have gone straight-on. I’d have been at the checkpoint within 10 mins. For some reason I took a right. It felt wrong, but it felt like I recognised it. It wouldn’t be fair if I was going the wrong way, so it just couldn’t be happening. Could it? For the next 25 minutes or so I pressed on, convincing myself that it would be fine. There was no real path by this stage and I was bundling through marshes and between trees. I crossed a raging river that shocked me to the core when the water reached up to my chest. It still wasn’t enough for me to accept that something wasn’t right though. My mind was playing tricks on me. I spotted a white transit van parked on a road beside the main river. As I got closer there was no van. There was no road. I then spotted 2 or 3 bridges ahead and each time I got there I’d been cruelly tricked by rocks or branches. I was losing it. Finally, I stopped and realised that I was close to becoming lost altogether never-mind ruining my race entirely. I turned around in a panic and did my best to re-trace my steps. By the time I finally reached a path I still wasn’t convinced what to do next – what f*cking way now!? I finally managed to get back to the fork in the road and went the way I should have gone. About 50m past the fork I recognised I was in the right place. If only I had done that in the first place I wouldn’t have blown my entire race. In that period something had gone dreadfully wrong and I was struggling to come to terms with it in my head. I had ruined my entire race and all the signs were there that I was going the wrong way. Why did I not just go straight on first? Why did I think it would be ok? Why didn’t the crossing of the river alert me to the madness? What was I going to do now? My support will think I bonked……I just want to go home now and put an end to this terrible nightmare. In some ways I clung on to the hope that it had just been a bad dream, maybe it hadn’t been that long? I got into the CP and I confirmed the inevitable – that I had blown it. I had dropped 2 places and lost maybe an hour. I also wasn’t sure where I’d find the energy / desire to complete the final 2 sections to Fort William (15 hard miles). I swore a bit. My sister swore back at me. I said I was done. My sister said I wasn’t. I asked what the point was? My sister said because you’ve f*cking dragged us out here since 11pm the previous day and you were going to finish it. With that, I was making my way to the tough climb out of Kinlochleven. I hated it. I hated them. Most of all I hated myself. The wheels had well and truly come off. In a blur of rage and upset I struggled up the steepest climb of the day and onto the pass towards Lundavra. I had asked for paracetemol to be ready at KL for the pain in my feet but in all the commotion of my navigational / mental collapse they had forgotten. It felt like punishment – perhaps no more than I deserved. These were without doubt, the darkest moments of the year for me. I just couldn’t shake the fact that I’d blown my chance to post a good first WHW race time. My first long ultra could have been a good one. Each step I took I thought about how I would have done it maybe an hour earlier and with a little more energy in my legs. I walked in parts I’d definitely have run. My shoulders had stooped and I’d left my running form somewhere in a bog above Kinlochleven. At Lundavra I shared some more sweary words with my Support (and anyone else who’d listen). I was force-fed some custard or rice pudding (couldn’t quite tell) and sent off up the hill, still muttering about my mistake. About 7 miles to go and a few steep climbs / descents. I just had to keep moving as much as I now hated the godforsaken race. When I finally reached the top of the last climb and onto the forest track I wasn’t feeling any more positive. I saw Craig in front walking the last few miles. We spoke for a minute. He was “burst.” I said sorry and moved on. Not that I felt much better, I just wanted to finish the thing. As I got closer to the Braveheart carpark there were some anxious people waiting for their runners. They all offered support and words of encouragement. It helped. A lot. As I turned onto the road I sensed that there was someone behind me. To my horror there was. It was only the super-talented Kate Jenkins. Great. Just what I needed. About a mile to go and I was going to have to leg it. I fixed my posture, picked up my feet and hit the road – 10K style. No-one was passing me at this stage of the race. No way. As I entered Fort William I passed the ‘end of the WHW’ sign and spotted my Dad. I asked him if I was ok – he looked behind me and said I was fine and that there was only a few hundred metres to go. I turned into the carpark and headed for the entrance of the leisure centre. And as I placed my hands on the doors it was over. The race that is. The aftermath runs on….. I finished in just over 19 hours and in 5th. It was a shame, I felt nothing positive about it at all. I probably should have made more of an effort to be happy at least for my wonderful support te am. The WHW puts you through a wringer and I couldn’t quite work out how I felt about everything. I was tired and sore too so I guess it was understandable. After a shower and a massage I reluctantly climbed into the back of the support car and headed back towards Glasgow with more questions than answers. Can I thank all the race organisers / marshalls / runners and support teams who made it a race that has changed something inside of me (for the better). I knew as soon as I placed my hands on the leisure centre doors at the end of the race that I’d be back to do it again. Thank you Stan for allowing me entry to such an amazing event. Thank you to Karen D for her words of encouragement and support. It’s clear that Karen and George give so much to the sport so that others can enjoy it. Your hard work is nothing short of amazing. Finally to my amazing Support team – Mum, Dad, Nicola and Natalie. I simply couldn’t have done it without you. You’re unfaltering support is more than I deserve. Let me know when you want to use your WHW crystal goblet. This entry was posted on July 1, 2011 by pyllon. It was filed under 2011, Conic Hill, Endurance, F-lite, Offroad, Race, Results, Running, Support, Trail, Ultra distance, ultramarathon, West Highland Way, West Highland Way, WHW and was tagged with endurance, Fort William, Glencoe, inov8, offroad, race, report, results, running, SUMS, ultra, ultra marathon, ultramarathon, West Highland Way, WHW. Thanks mate – u know how much that means to me. Fantastic Paul. Your strength, courage and determination are inspiring! This race has made you stronger andthe experience of river walking means it won’t ever happen again! You’ll be back stronger and even more determined (which scares me)! So dry yer eyes and man up bro!! And dont forget Paul, you actually came fifth on first race ever of that distance, something lots of people can only dream of! You were awesome! Rhona, those are really kind words. Thank you so much! I saw you finishing and banging your head against the wall of the Leisure Centre. I was not quite sure what was going on in your head then. Why not be happy that you finished this monstrous challenge? But reading your report I pretty much understand your frustration. Running in 4th place and having even a chance to get into 3rd and then getting lost is not what you want in an ultra. It’s not unjury or stomach or the fatigued legs (I think you would have forgiven yourself for those kind of problems) but a navigational mistake. That’s probably the worst to come to term with. Take Stuart Mills’ – he’s lost races because of making even smaller navigational mistakes. Or look at the Western States’ accounts of the runners. And in the Alps Lucy Colquhoun “lost” the CCC once because she took the wrong turn. Enough said about that. For a first season in Ultra Running you are doing pretty well (which is probably an understatement) and there is no reason why you should not be even stronger next year! Thomas, that’s reallykind of you to take the time to comment – thank you! You’re totally right (of course), need to just put it down to experience. That was an amazing time you posted – can only assume you’re delighted!? I know how much the WHW race means to you. Hopefully get a chance to chat to you at the next race. So difficult to judge first time at the distance! Hope you’re well mate and still enjoying looking at that goblet! I was hanging on to your every word all the way through your report. I felt completely gutted for you when you spoke about your unscheduled river crossing – and yet you still posted a fantastic time! I hope you’ll be back to post an awesome PB. 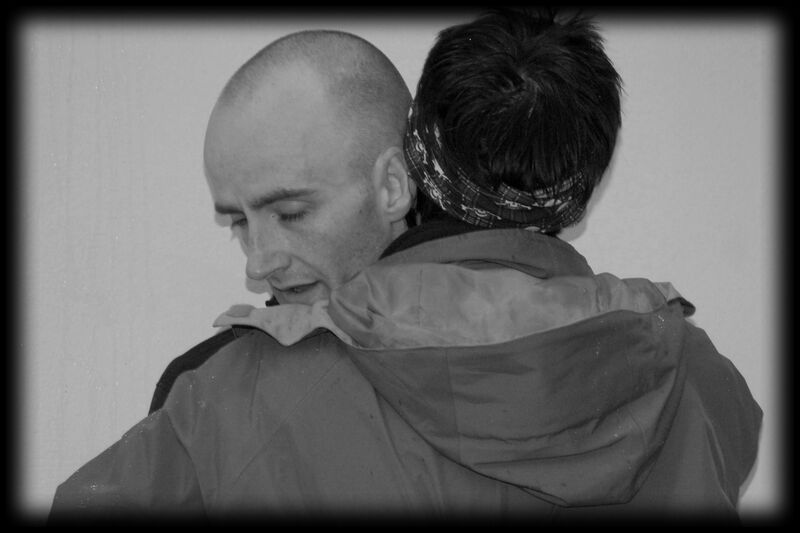 (Your support crew are lovely too – their comments above made me all emotional). Thank you! Yep, I’ve very lucky to have such an amazing support team. Fantasic read and a very impressive effort. Thats a great achievment on you 5th place. Hands up for a winter WHW race! Anyone? I totally understand your frusrations Paul, i got lost last year on Clyde stride and even though its no comparison ie- i was’nt likely to be placed it still properly messed with my head/race. I also felt a bit emotionless after WHW race but for different reasons. You are an amazing runner, having had pleasure of seeing your crew so much over Cateran i think you’re very lucky to have such great support from them. Thank you so much Sandra – that was really kind of you to post a comment. I think getting lost must mess with your head in any race and at any time! Let’s hope we’ve both learned from it! Yep, I’ve a brilliant support – very lucky indeed. How are you feeling now? Much better I hope!? Until I read your report I hadn’t realised you’d got lost and ‘wasted’ an hour. That is really tough and so well done on keeping going and finishing. I’m sure this will motivate you throughout the winter and you’ll come back next year ready to put it right. Thanks for sharing your story. It was really interesting to read how you tackled your first long one. We all know there is lots more to come. I’ve not forgotten about that run on the Braes … I’m looking forward to it. John, thanks a lot for your words. You’re right – it’ll keep me going over the winter! Would be delighted to meet up for a run, just let me know when you fancy it. PS: I should probably add to my previous comment: Lucy got lost in the CCC in 2007 and ran the CCC in 2008 again and this time she did not get lost and won! Hi Peter, thanks a lot for your post – really appreciate it! Feel slightly less disappointed now (of course!). Sounds like u had a challenging race. Can’t imagine just how tough it must have been with a cold etc. Amazing to finish considering (and with that time!). U got any others races coming up?